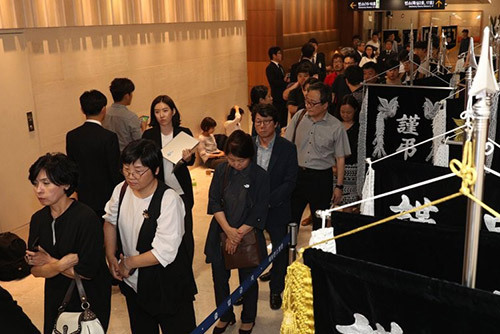 Mourners continued to flood Yonsei University’s Severance Hospital late into the night on Monday to visit a memorial altar for late Justice Party lawmaker Roh Hoe-chan. Key lawmakers paid their respects, including National Assembly Speaker Moon Hee-sang and party floor leaders who had traveled to the U.S. with Roh just last weekend. The altar was filled with flowers sent from those wishing to pay their respects, including President Moon Jae-in. Roh’s funeral service will be held at the National Assembly at 10 a.m. Friday. Roh took his own life Monday by jumping from the window of an apartment building in Seoul's Jung district. His death comes amid allegations that he received 50 million won in illegal political funds from "druking," a blogger involved in an opinion rigging scandal.